Perhaps you've been ignoring your old photos and memories, but you're finally ready to do something with them. It's possible you're itching to declutter those bins of kids' school work tucked into a corner of the guest room closet. Or maybe you’ve captured tons of photos and videos from your travels, and they’re still just sitting on your phone, collecting digital dust. I’ve been in each one of these spots - I’m actually still in a couple of these spots! We created and captured these memories over the course of several years (or decades, in some cases), and we’re not going to resolve them overnight. But I think it’s worth ripping off the band-aid when it comes to pretending they’ll just resolve themselves. I want you to banish the idea that you don’t have to think about your memories because they probably won’t even matter down the road. And until you tackle them, your memories will only continue to accumulate, causing more stress and overwhelm. So let’s start thinking about how we’re going to tackle some of our memories so we can enjoy them rather than ignore them. What memories am I wanting to document and how am I going to document them? I've written in more detail about how to get started memory-keeping, but you probably have some idea of which events, years, experiences, or memorabilia you want to document. In order to determine HOW you’re going to tackle those memories, you have to know which memory-keeping method best suits the type of memories you're hoping to document. I’m going to break this down so you can start organizing the process in your head, even if you don’t have the time or emotional bandwidth to tackle this stuff today. And if you know right off the bat that you don't want to tackle this yourself, then sign up here and you'll be among the first to know when I'm working with clients. For the DIY-ers, the motivated, and the curious, read on. This may sound like a lot, but hear me out: you certainly don’t have to adopt all of these. I'm hoping to help you figure out what might be the most relevant projects to match your goals, your lifestyle, and the way you like to capture your memories. Why document with a photo book? There are lots of reason to document with photo books, but I'll cover a few of the most compelling for me. You don’t need anything beyond an internet connection. With software for creating photo books available on individual vendor websites (like Artifact Uprising, Shutterfly, or Blurb), you don’t need any fancy software or equipment to complete a book. In fact, plenty of vendors offer apps from which you can upload photos to a photo book, making the process easy to complete on your phone. Bottom line: you need photos, the internet, and a credit card to pay for your photo book. Very simple. Photo books are easy to edit, add to, and share. Because you design a photo book digitally on a website, where your project can be stored over time, you can easily add pages, make modifications, and add captions as you go or after you’re done. You can also order multiple copies of one book, so getting a copy for the grandparents is as simple as upping your quantity. They range in quality and cost, so you can get what works for your project. One nice thing about photo books is there’s just a huge range of options out there these days. From layflat albums to soft-cover books, you can put one together inexpensively or create something that will be an heirloom. They can be assembled quickly. If you’ve done the hard work of selecting your photos, then it’s as simple as uploading them to your vendor of choice, making sure they’re in the right spots, and sending the book to print. Depending on how detailed you want to get with captions or editing, you really can put this project together in a short amount of time. When to document with a photo book? Gather your photos, pick a vendor, and get started uploading those photos to the vendor’s website or app. My favorites are Blurb and Artifact Uprising. Some vendors even have book-builder options where the website basically plugs photos in for you. I prefer editing text with Blurb’s Book Smart software, so if you want to include captions or other text, I’d go with Blurb. And I'll add that I do think text is important. It gives context to your photos and enables you to add detail you may not have been able to capture with a photo. The biggest single (and simple) tip I can give for assembling a photo book is to select your photos first, get them somewhere you can easily access them, and then create your photo book. The hardest part of a photo-heavy project like this is selecting the photos, so do that before you get into any vendor's website to create your book. There’s a lot to say in this section, but I’m going to attempt to stay focused. The traditional albums I use are from a system called Project Life, which - if you’re unfamiliar - is basically a binder filled with plastic page protectors, into which you can slip printed photos and bits of memorabilia. The big benefit of a traditional album or a pocket page system is that you can include physical items you want to keep organized among your photos. Along with photos, you can include things like kids’ artwork or writing samples, a hospital bracelet, an award or certificate. Maybe you want to keep these items alongside photos, rather then lumped into a bin or box. If that’s the case, then a pocket page album is a great way to do this. Another real difference between this form of memory-keeping and any other is really the tactile quality of the pages. Think about your mom’s old school photo albums. There’s something really satisfying and even grounding about flipping through physical pages, seeing printed photos, being able to touch and feel samples of your child’s artwork. That feeling is hard to capture with a photo book. It’s just different. My kids love flipping through our Project Life albums, but I wouldn't hand a photo book to our three year old. However, he’s welcome to flip through those plastic page protectors in our Project Life albums. Again, I’ll use Project Life as my specific medium here, since it’s what I use, but a quick Google search will uncover lots of other options. First, gather any physical items you want to include, like school work, old printed photos, or little bits of memorabilia. Photograph anything that’s too big to fit in the album. Here's how I do this. Gather your photos and send them to print via an online vendor like Persnickety Prints. You can also use the Project Life app to print photos. Order the supplies you’ll need to get started. I will say it’s incredibly satisfying slipping pictures into those plastic pockets and flipping through an album with lots of completed pages. Oh, video. It’s the future, or something like that. There’s nothing my kids love more than watching themselves on video. And there’s nothing more awkward for Moms than appearing on video! But it’s here to stay, and it’s easier than ever to get started. I’m going to cover video in more detail in subsequent posts, but here’s an overview on the why, when, and how to incorporate it into your memory-keeping practice. There’s nothing quite like video to transport you back to a moment in time. While photos can really capture emotion, video can truly be a time machine. Video also captures voice, which is something I don’t think we capture enough of as moms, considering our kids’ voices change so rapidly throughout the years we’re raising them. Video is easy to create these days, with easy to download software for your desktop or even your phone. One of my favorite things about video is that it’s eminently shareable. Just upload your video to a Vimeo account and send the link to grandma or share the link on Facebook. Boom, done. Video enables you to tell a story in just a few minutes. My sister, Jacqueline, is such a gifted videographer and editor. She knows just what to include to evoke emotion and really transport the viewer to a moment in time, and she does it in just two or three minute videos, which really is an ideal amount of time for our limited attention spans. Bottom line: there are lots of reasons to incorporate more video in your life, and the barriers to entry are increasingly lower. You may have a program already built into your computer software, like iMovie for iOS. But you can also start with an app. If you have an iPhone, play around with the Memories feature in Photos, which will create slideshows for you with music and transitions you can select and edit. 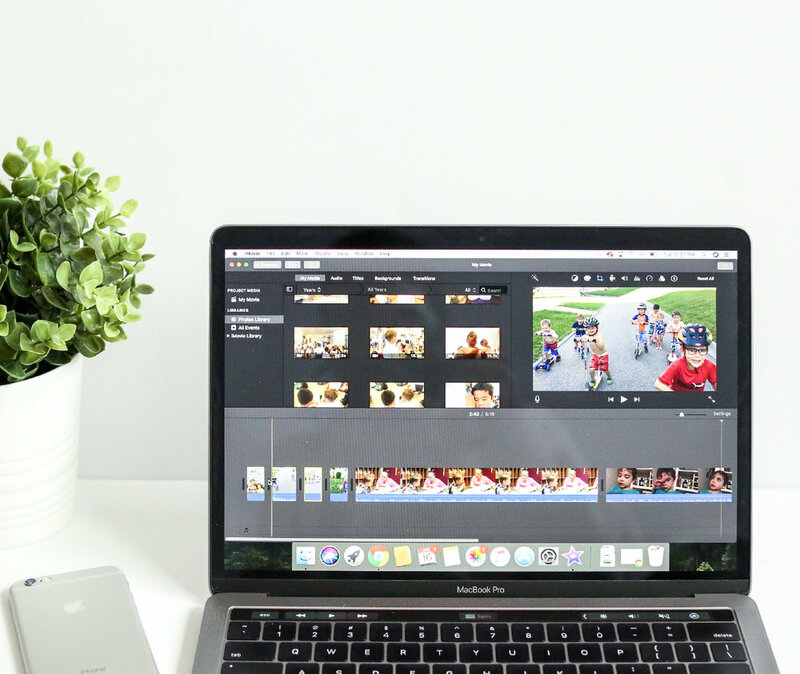 For the more adventurous or ambitious, there’s Final Cut Pro - a pricey option with more tools than I can possibly begin to utilize without some serious time commitment. Still, it’s an option. Final Cut provides lots more customization of titles and transitions than iMovie, but it’s not for the beginner. Most of all, just start capturing more video. Experiment with close-ups, landscapes, slow motion, and time-lapse. And for the love of Snapchat, turn your phone sideways so your videos are horizontal, not vertical. Vertical video is fine for social media, but if you ever want to stream this on a TV or larger screen, turn your phone. I can't deal with watching the vertical videos people submit to the Today Show. Please, turn your phone 90 degrees unless you're planning to only put that video on social media. Plus, your videos will feel more cinematic and less amateurish. I'll cover lots more about video this year, but hopefully this gets you capturing more of it and considering the possibility of creating more simple, beautiful videos for your family. If you're ready to tackle your memories, then make sure you're following along on Instagram as I share more about the nuts and bolts of this process. In two weeks, I'll be sharing my memory-keeping goals for 2018, which includes how I'm using each of these mediums to document different parts of our year (including catching up on past projects). What medium do you think works best for you? Let me know over on Instagram. And if you'd rather not tackle your memories alone, then let's work together. I'm taking on clients and offering memory-keeping services this spring, and you'll be the first to know when they're available. Check your email to confirm your subscription and you'll get instant access to my FREE phone photography workshop.